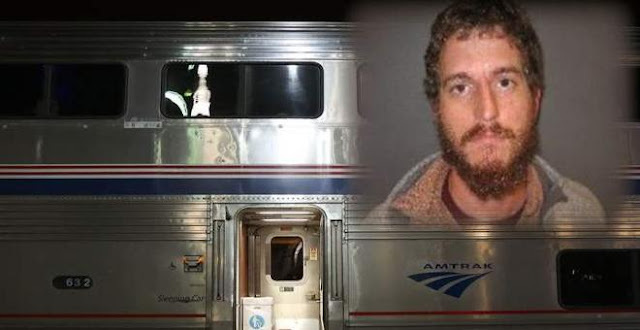 Taylor Michael Wilson, from Missouri, has pleaded guilty to a Federal Terrorism charge over the October 2017 Amtrak attack, during which he boarded a train in California carrying a .38 handgun, ammunition, respiratory mask, a hammer, knife, speed loaders, and ID relating to the National Socialist Movement. Wilson, who claimed he 'dropped acid' before the attack, sabotaged the train by as it passed through Nebraska, disabling its engine and cut the lights, causing panic among its 175 passengers. The court heard that Wilson reached for his waistband where the handgun was, though conductors kept him from grabbing it. The weapon was later recovered by the first deputy on the scene. When agents searched Wilson’s St. Charles home in December 2017 they discovered hollowed-out walls full of Nazi propaganda, body armor, ammunition, and “pressure plates that can be used to make an explosive device.” They also found “numerous firearms,” including ones not legally registered, such as a fully automatic machine gun and a short-barrel rifle. Wilson is awaiting sentencing at the District Court for Nebraska. While Trump bans Muslims due to the 'terror threat' - except from nations he does business with, of course - native-born white Americans, mostly White Supremacist types, are responsible for nearly 90% of Terror Attacks in the USA in the last three years. America, your own boys are the real threat.